Vivekanandan Manokaran - The Weblog of a Software Engineer: Indian Rupee Gets a Unique Symbol. NEW DELHI: The Indian rupee will soon have a unique symbol — a blend of the Devanagri 'Ra' and Roman 'R' — joining elite currencies like the US dollar, euro, British pound and Japanese yen in having a distinct identity. The new symbol, designed by Bombay IIT post-graduate D Udaya Kumar, was approved by the cabinet today — reflecting that the Indian currency, backed by an over-trillion dollar economy, was finally making its presence felt on the international scene. "It's a big statement on the Indian currency... The symbol would lend a distinctive character and identity to the currency and further highlight the strength and global face of the Indian economy," Information and Broadcasting Minister Ambika Soni told reporters after the cabinet meeting. Though the symbol will not be printed or embossed on currency notes or coins, it would be included in the 'Unicode Standard' and major scripts of the world to ensure that it is easily displayed and printed in the electronic and print media. Among currencies with distinctive identities, only the pound sterling has its symbol printed on the notes. Unicode is an international standard that allows text data to be interchanged globally without conflict. After incorporation in the global and Indian codes, the symbol would be used by all individuals and entities within and outside the country. The symbol will be adopted in a span of six months in the country, and within 18 to 24 months globally, Soni said, adding that it will feature on computer keyboards and softwares for worldwide use. Soni said that the symbol, which reflects the Indian ethos and culture, would help distinguish the currency from the rupee or rupiah of other countries like Pakistan, Nepal, Sri Lanka and Indonesia. Besides this, state governments would be asked to proactively promote the use of the new symbol, she added. 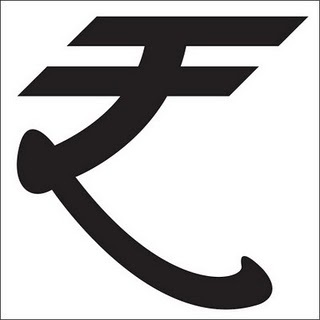 Kumar's entry was chosen from 3,000 designs competing for the currency symbol. He will get an award of Rs 2.5 lakh. "It is a perfect blend of Indian and Roman letters — capital 'R' and Devanagri 'Ra' which represents rupaiah, to appeal to international and Indian audiences... My design is based on the tricolour, with two lines at the top and white space in between," a visibly-happy Kumar said. The jury, which had sent the five short-listed entries for the cabinet's approval, was headed by a Reserve Bank Deputy Governor.